Deploying the glider Donglai Gong deploys the glider from a Zodiac in Arctic waters. Retreiving the glider Donglai Gong and a colleague retrieve the glider from a Zodiac from Arctic waters while the USCGC Healy awaits in the background. When beachgoers gaze seaward, most see an apparently uniform expanse of water stretching to the horizon. For Donglai Gong, the view is very different. Gong, a new faculty member at William & Mary’s Virginia Institute of Marine Science, is a physical oceanographer who uses gliders and moorings to study the movement and properties of coastal waters. One focus of his research is the mid-Atlantic Bight—the concave arc of water between Cape Hatteras and Cape Cod that includes the mouths of Chesapeake Bay, Delaware Bay, and the Hudson River. Gong’s doctoral research reveals that this area is a dynamic system in which parcels of water with different salinities, temperatures, oxygen levels, and densities flow and swirl along the continental shelf, influencing everything from weather and climate to the dispersal of fish and shellfish larvae, the transport of pollutants, and the commercial and recreational activities of the area’s 50 million coastal residents. 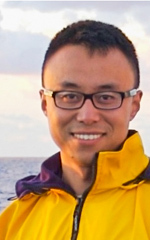 Gong arrived at VIMS in October 2012 after a two-year post-doctoral fellowship at the Woods Hole Oceanographic Institution. He earned his Ph.D. at Rutgers University in 2010, with a dissertation entitled “Mesoscale Variability on the mid/outer NJ Shelf: Effects of Environmental Forcing on Circulation, Hydrography and Transport." Before earning his Ph.D., Gong received a Master’s degree in physics from the Massachusetts Institute of Technology, with a thesis entitled “Quasar spectroscopy in UV and X-ray: probing the intergalactic medium using helium and oxygen.” He says his shift from physics to marine science reflects a desire to connect with the world and address humanity’s most pressing challenges. Gong can trace studies of the Mid-Atlantic Bight all the way back to pioneering oceanographer Henry Bigelow. But rather than relying on the Niskin Bottles and drifters used by Bigelow and other 20th-century scientists, Gong employs the most modern of oceanographic research tools—unmanned gliders. Gliders are torpedo-shaped autonomous underwater vehicles that combine changes in buoyancy with a pair of fins to propel themselves through the water. Gong says their most valuable feature is the ability to perform extended missions over a vast region. Gong has in fact used gliders in Arctic waters, during a two-year project in the Chukchi Sea along Alaska’s North Slope as part of his post-doctoral research. He is now analyzing those data for publication, focusing on how water masses change as they move from the Pacific into the Arctic through the Bering Strait. Arctic waters are a hotspot of current oceanographic research in light of the area’s rapidly warming climate and disappearing sea ice. Before his Arctic research, and nearer his new home in Gloucester Point, Gong used data from gliders and moorings to address a puzzle in the oceanography of the Mid-Atlantic Bight—what he calls the “Salt Budget Dilemma.” Simply put, the Bight waters are saltier than they should be according to the estimated difference between precipitation and evaporation. The effect becomes more pronounced further south in the lower Bight, nearer Chesapeake Bay. Gong approached this puzzle by studying the factors that control one of the Bight’s key oceanographic features—the “shelfbreak front.” This fluctuating boundary separates the relatively fresh and cold waters of the continental shelf, highly influenced by river input, from the warmer, saltier waters seaward of the continental slope. “The front is a complex, three-dimensional feature,” says Gong. “Its shape and structure change both seasonally—with major shifts between summer and winter—and to a lesser degree every few days to weeks.” His research reveals that these changes are driven by winds, the oceanic pressure gradient, movement of a sub-surface “cold pool,” and the influence of eddies and rings that spin off the Gulf Stream. At VIMS, Gong plans to approach his studies of the Mid-Atlantic Bight from both directions—the deep sea and shallow estuaries like Chesapeake Bay. “I’d really like to look at submarine canyons,” says Gong. “Studies from the West Coast suggest that canyons play a big role in facilitating the exchange of materials, organisms, and nutrients across the shelf break.” He has already submitted a proposal to the National Science Foundation to place gliders and moorings near the Hudson Canyon, off Long Island, and has eyes on the Norfolk Canyon off Virginia as well.